Last Sunday I climbed Mount Takao (Takao-san=高尾山), a beautiful 599m peak in Western Tokyo less than an hour by train from Shinjuku Station. On a good day you can even see Mount Fuji from the top! Getting off at Takaosan-guchi Station, it is possible to skip the steepest part of the climb and take the cable car or chair lift to half-way, though no part of the climb is particularly hard. This is a popular spot so expect to ascend slowly taking in various temples, shrines, torii, and very old cedar trees along the paved route up. 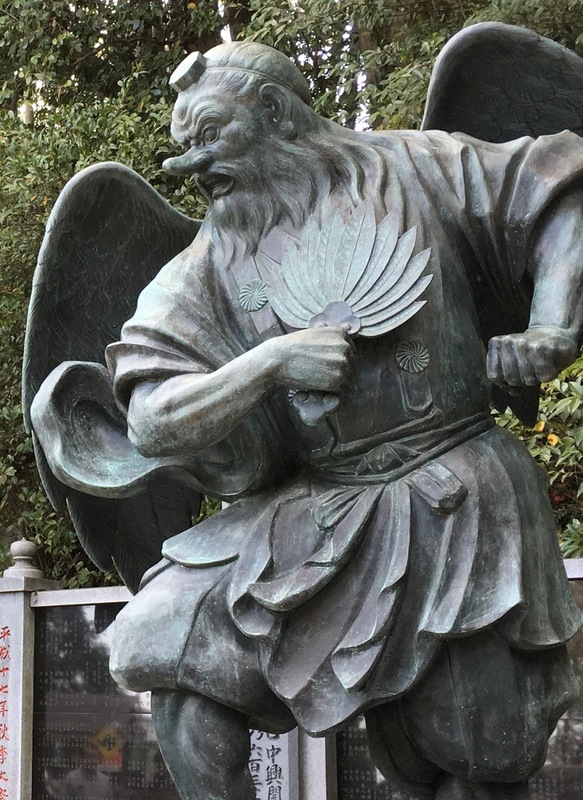 Takao is a sacred mountain and you will see many instances of the long-nosed Demon/God Tengu (pictured, right, at Takao Station and, left, further up the peak) who acts as the protector of the mountain. In Japan, if someone is acting in an arrogant, conceited, or haughty fashion people might place their fist in front of their nose to impersonate Tengu and say that that person is "becoming Tengu" (tengu ni naru).